(Include: Sally G. Thomas Fellowship on the memo line). Dr. Virginia Farmer, Meadowmount School of Music alumna, passed away on June 11, 2013 in Urbana, Illinois. Her entire collection of violins, violas and bows was bequeathed to Meadowmount to establish a Virginia Farmer Memorial Scholarship Fund for deserving violin students. She attended Meadowmount from 1950 to 1955 as a violin student of Ivan Galamian and was coached in chamber music by Josef Gingold and Leonard Rose. Dr. Farmer was born in 1922 and received her undergraduate degree from the Eastman School of Music. 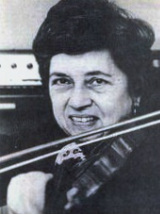 In 1944, she was chosen by conductor Dmitri Mitropoulis to be one of the first female violinists in the string section of the Minneapolis Symphony. She devoted the majority of her professional life to the School of Music of the University of Illinois where she retired in 1992. An avid Baroque music enthusiast, Dr. Farmer continued performing at festivals around the world until 2000.Meadowmount faculty member, Sally Thomas was a friend and colleague of Dr. Farmer and remembers her, fondly. For those wishing to make a tax-deductible contribution to the Virginia Farmer Memorial Scholarship, please make your check payable to Meadowmount School of Music and include Virginia Farmer Memorial Scholarship on the memo line. Click here for more details, including donation information. tax-deductible as Meadowmount is a 501(C)3 non-profit organization. Your gift can be aimed at the General Fund or towards a specific purpose. Mention "Galamian Scholarship Fund" or "70th Anniversary" or perhaps "Sponsor a student" or "Building Maintenance" in the memo on the check. Your support of the school would be greatly appreciated.